Glimpses of Modern Indian Philately: 1st April 1948 - Pakistan Treated as Foreign Country. 1st April 1948 - Pakistan Treated as Foreign Country. After partition, the exchange of mails between India and Pakistan continued as it was before partition, but it was not smooth. Therefore from 1st November 1947, Offices of Exchange for Surface Mail, for Accountable Articles became Delhi for Lahore and Mcleodganj, Jodhpur for Hyderabad Sind and Bombay for Sea Mail to Karachi, for West Pakistan. Calcutta, Maldah, Jalpaiguri, Cooch Behar, Golakganj, Silchar, Agartala and Katihar for East Pakistan (Dacca). Ordinary Mail including Registered & Unregistered Articles will be exchanged directly by Offices and Sections in India, in closed bags, vide DGPO Circular No.38 dated 31st October 1947. Dead Letter P. O. of India will directly deal with D. L. O., of Pakistan vide DGPO Circular No.47 dated 1st December 1947. It appears that Air Mail to and from Pakistan was carried by Air India's Karachi - Madras Air Service. 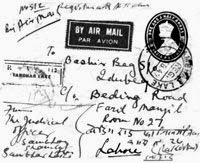 But from 26th January 1948, Air Mail from Pakistan will be despatched for India only through Orient Airways thrice weekly service between Karachi - Calcutta and by BOAC Service between Karachi - Delhi. Air Mail from India to Pakistan remain unchanged. The Postal Rates remained same, as it was prevailing before 15th August 1947 (Inland Postal Rates) vide Postal Notice No.56 dated 26th January 1948. A. Letters, Single & Reply Paid Postcards, Printed Papers, Business Papers, Sample Packets, & Blind Literature Packets will be dealt as prescribed in Section III of the Indian P & T Guide. B. Articles liable to Custom Duty will be dealt as per Clause 206 of the P & T Guide. C. Registration, Express Delivery, Business Reply System, Money Order, Value Payable Post, Insurance and Parcel Services will be available as per terms of Indian Inland Service and as prescribed in P & T Guide. Prepayment of Postage is compulsory. 1. Letters 3½ as., for 1oz., + 2 as., for every additional 1oz. 2. Postcard 2 as., for Single and 4 as., for Reply. 3. Printed Papers 9 pies for every 2oz. 4. News Papers Inland Postal Rates will be apply. 5. Business Papers 3½ as., for a weight not exceeding 10oz., and for every add. 2 oz., will be 9 pies. 6. Sample Packets 1½ as., for 4 oz., + 9 pies for every additional 2oz. 7. Blind Literature Packets ½ anna for every 2½ Lbs. 8. Business Reply System The postage recoverable from the addressor on foreign postal rates. 9. Insurance 5½ as., per Rs. 200/-. 10. Acknowledgment 3 as., per article. 11. Money Order, Air Mail MO, Telegraphic MO will be treated in same manner as of Burma. 12. Value Payable Post articles will be dealt as of other foreign countries. 13. Postal Order issued before 31st March 1948 will be paid till 30th September 1948. No Postal order will be accepted after 31st March 1948. The above Postal Rates were reduced on and from 15th May 1948. The Indian Inland Postage Rates would apply on all classes of Postal Articles sent from India to Pakistan, except Business Reply Envelopes and Cards, which were not allowed to be exchanged between the two countries and Parcel Service would remain by registration only, vide Postal Notice No.13 dated 13th May 1948. 1) Letters and Packets 1½ as per tola or part in addition to ordinary postage 1½ as + 1½ as = 3 as. 2) Post Cards 9 pies per card in addition to ordinary postage 9p + 6p = 1¼ as. 3) Money Order 1½ as per Money order in addition to the ordinary MO Commission. The above rates of Air Mail again confirmed by Postal Notice No.46 dated 25th October 1948. Postal rates from 1st April 1949 for Pakistan again changed due to revision in Inland Postal rates of India. Air Mail fee remained same. Therefore by Air Letter or Packet will be 2 as + 1½ as = 3½ as, Post Card will be 9 pies + 9 pies = 1½ as and MO will be 1½ as irrespective of amount. When Air Letter (Aerogramme) service was introduced to various foreign countries on 1st September 1950, the Air Mail rates for Letter Mail, Post Cards, Packets etc. were also revised. But the Air Mail fees for Pakistan remained same. For Letters 3½ as (2 as Inland postage + 1½ as Air Mail fees), for Post Cards 1½ as (9 pies + 9 pies) and for Aerogramme 3as (1½as + 1½ as). 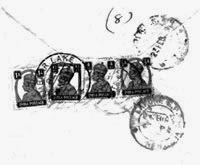 The Airmail registered letter with Acknowledgement posted from Sambhar Lake (Rajasthan) to Lahore dated 21st February 1949 with the total postage of 8½ as.